Alex shares his insights and experiences working with cane growers in the Reef catchment. Introduction: The Great Barrier Reef needs to be fighting fit to cope with climate change. While the world takes action to address climate change, improving water quality is the best thing we can do to increase the Reef’s resilience. Run-off from the neighbouring catchment can cause all sorts of problems when pollutants end up in delicately balanced reef ecosystems. In this podcast series we talk to farmers, scientists, extension officers and local experts to hear their water quality perspectives. Vanessa: Do you find that it's there working with people and working with the environment. Is that the combination you enjoy? Alex: Definitely it's very satisfying. Sugar cane farmers are good people and it's great to be able to assist them. 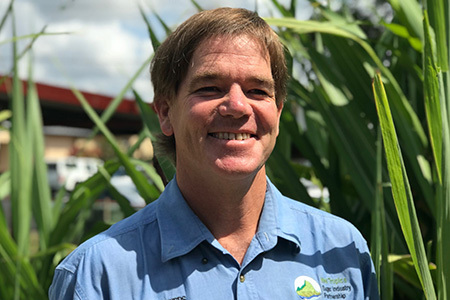 Alex: I guess one of the things about the wet tropics sugar industry partnership is that we are seen as being part of the canegrower community. We're not seen as being from government or an external provider. Alex: And it's also fair to say that sales agronomists have a lot of knowledge about how to grow good sugarcane crops, excellent knowledge about fertilizer use, I guess they are also driven by selling product and I don't have that in this role, it's great. I'm literally there for the farmer and to assist the farmer alone. Vanessa: So youspend a lot of time on properties? Vanessa: Are canegrowers the kind of people who are happy to leave their farm and come and attend workshops? Alex: It's quite interesting. Canegrowers are a diverse group of people, all ranges of the spectrum but you know there's big ones and small ones and old ones and young ones and corporate type farmers and family farmers. So this is a diverse range of people. Certainly some people are most comfortable home and I'm always happy to go to their place and sit at their kitchen table and talk. Vanessa: You mentioned performance and I'd love to hear more about what constitutes good performance for a cane farmer. Alex: So Tully’s a little bit unique. Well certainly the Wet Tropics is all governed very much about the rainfall. So in wet years the cane doesn't grow so much in dry years it grows much better and so we are looking at actual yield performance tonnes per hectare but especially tonnes of sugar per hectare. This is where you start getting into the interesting agronomy about nutrient combinations and so forth. We talk about tons of cane per hectare but then one ton of cane might have a lower cane content than another tonne of cane. So in fact payment is based on sugar so it's a combination of tonnes of cane and what's called a commercial content of sugar or CCS; combined produces the tonnes of sugar and that's what really matters. Vanessa: So let's get into the water quality issue. It is a hot topic for farmers and what we're trying to do with these podcast interviews is actually get different perspectives. If you could tell us about how water quality comes up in your job? Alex: So there's a big focus on nitrogen. Nitrogen is actually one of only 16 essential nutrients involved in plant growth but it is a very important nutrient to commercial agriculture and especially to grass, grasses and sugarcane is of course grass. It's important that the crop gets adequate nitrogen if it doesn't it won't produce what it could produce and therefore the farm won’t be as profitable as they could. Nitrogen in the tropics is a very volatile nutrient. It moves rapidly either to the environment or to the environment either to the atmosphere or off site. So there's a real focus on limiting the amount of nitrogen that's lost off farm and in the Nutrient Management Plan process that involves matching the optimum amount of nitrogen to the crop demand. Vanessa: So ultimately the plant will get as much as it needs and we don't lose. Hopefully we don't lose much off the farm. Could you talk about how nitrogen might be lost from the farm? Alex: So the two obvious pathways are up into the atmosphere as a gas or down through the soil through the soil water in liquid form. There is a third pathway which is washed over land off the farm but in the green trash blanket system that's not a major loss pathway. So in the Wet Tropics our big concern when nitrogen is placed we have a high rainfall event the soil and the water moves down into the soil into the subsoil moisture and then through the water table. That's our big concern. If nitrogen is lost to the environment into the atmosphere. Well that's a shame for the farmer because he's paid for the fertilizer but it's it's essentially not a Reef issue. Vanessa: I was hoping we've talked a little bit about the problem of nitrogen and fertilizer and I can imagine even from the point of view of saving money this is an issue for farmers. But what are they doing to try and minimise loss? Alex: One of the challenges of sugarcane is that it grows really quickly. So there are limited opportunities to apply the fertilizer in more than one occasion. One of the fundamental challenges of sugarcane is that you more or less have one go to put the fertiliser down. There are a range of products out there which have delayed or slower release forms of nitrogen and that's certainly one area that people have looked into. One of the important things is actually around the timing it's around matching when the crop needs the fertiliser applied and also being very mindful of the storms or the wet season forecast so optimising around timing and around form are two ways growers can certainly manage the issues. The other thing I guess is better matching the crop demand with what's inherently the fertility of the soil. Vanessa: Can you tell us how farmers know which fertiliser to apply? Alex: Cane has been researching wetland for quite a long time. The crop nutrition requirements through the Bureau of Sugar Experiment Stations now Sugar Research Australia has a well acknowledged process called the Six Easy Steps and the SRA provide guidelines attached to the 6 easy steps process that indicate that soils with a given fertility status of various nutrients, the recommended amount of fertilizer that that should be applied. So what we will literally do is get a soil test result, compare the results of the soil test with the SRA guideline values and then work out from there this is the amount of nitrogen phosphorus potassium sulfur etc that the crop will require what's probably happening more to the fore now is that growers are very much looking at the variation in soil type across the farm and applying exactly the right fertilizer for that the variation in soil type historically growers will have used the one type of fertilizer across the whole farm but more and more growers are becoming sophisticated matching the fertiliser to the soil variation on their farm and even within paddock. Vanessa: So I guess what you're talking about is applying science on the farm and that's a nice segue into the issue of science because do you see farmers as being scientists in a way? Alex: Absolutely. To me scientists are people who observe things in nature, wonder what causes them and essentially trial to see if their hypotheses is correct. Every farmer I work with does their own trials, figures out what rates fertiliser to use, what machines to use, what time of year to be doing things, what chemicals to use. Farmers very much are trial-ers by nature and I don't think it's too much to say that that's a scientific approach. Vanessa: How could we do a better job at sharing water quality science with farmers? Alex: Well in fact I wonder if the question is the other way around. How do we do a better job of listening to what farmers know about their farms and then looking at what we know about water quality science and social science and agronomy and understanding where the common ground is between the two. Vanessa: How does that happen in real life? Alex: This is the core of the nutrient management process. Sit down with the grower. I'm not assuming that I know anything about that grower’s land or the varieties they are growing or anything about the history of the land. The grower knows that. Tell me what they understand about their farm, the history of the farm, why particular areas underperform, why they don't. I've got a fairly good knowledge of the scientific literature in terms of why things might be happening and it's a two way process where I might be able to explain to the grower this would be an explanation for that. There'll be some things they'll tell me and I’ll think I can’t understand that so we'll need to look a bit further into what's going on. One of the great things about the nutrient management process is it's it's ongoing you know. Vanessa: Do you feel like you become, that your knowledge of cane farms is growing all the time? Alex: Like I say it's actually quite interesting it's a very common thing to be said sugarcane agronomy is really easy and probably 80 percent of it is very straightforward but it's that 20 percent that customises it to that particular parcel of land, that particular farming enterprise that results in the profitable outcome for the grower. And it's certainly it's it's the satisfaction. Yeah and the challenge that drives me. Vanessa: If you had unlimited resources to help farmers improve their practices what do you think you could add that would make it even easier for them? Alex: As I said before the biggest challenge in sugarcane is that after harvest especially it just grows so very quickly so you've really got a narrow window in which you could apply that fertilizer. If there was a way to apply the fertilizer in you know repeatedly through the growth cycle as happens in horticultural crops. I think we'll be much better able to match the crop demand to the fertiliser output. In the Wet Tropics I don't see that that's a realistic opportunity. It is in an irrigated system but probably not in a rain fed system. Alex: The other thing I think it's worthwhile saying here is that no one wants to spend any more on fertiliser than they have to but it is a huge risk to the farm if you don't put enough fertiliser on and you don't grow as much as you could. So to fine tune that process where the grower can sleep comfortably at night knowing that they've given the crop the adequate nutrition, while at the same time hasn't paid for any nutrition that's not required and will be lost to the environment, that's where everyone's focused on doing. So any tools that can help that outcome, that's what I've been looking for. Vanessa: I was wondering if you were able to give any insights about the whole monitoring and modeling information that's shared, where catchment loads are assessed at the ends of rivers and I know there's been controversy with cane farmers over the years about the way this information is gathered and shared. Do you have any insights on that part? Alex:Well I guess the insight is that as I say nitrogen is not the only nutrient involved but it is the focus so let's talk about nitrogen for a moment. If nitrogen was coloured we could see it but it isn't, it's it's soluble in water. So we look at water with high nitrogen and we look at water with low nitrogen and it has the same colour. So we can’t actually see whether that water has high nitrogen content or not. One of the interesting experiences I had in Tully in fact in the Murray just south of Tully there was an early season flood and there was about half a metre of water flowing across the road and it was clear rainwater. It was as clear as you might like to see and then the water quality scientists are telling us this is terrible stuff, it's hurting the environment. It's very hard to see how this beautiful clear rainwater can be hurting the environment. So my little insight is it doesn't look harmful and I can't tell by looking if it's good or not. So of course you know I respect what the water quality monitoring people are telling me. But I can't look at this beautiful clean water and know instinctively whether it's good or bad. Vanessa: So if there are monitoring stations that show the local community the kinds of invisible pollutants appearing in that water. How is that received? Alex: Every farmer will say if you can tell me, if you can show me that the nitrogen is coming off my farm I'll do something about it. So every family will say prove to me that that fertiliser is coming off my land and I'll do something about it. You know you could spend a lot of money doing a whole lot of monitoring. It's a very challenging process but you know we have good people on the ground, the Major Integrated Project and certainly the State Government have water quality monitoring people who are producing information. It is there for people to see at an individual farm level - it's not there. Whether or not that's something to go down that path or not. Each grower, no grower wants to be harming the environment. We don't want there to be nitrogen entering the environment. When you get into it, it is very complicated that there's not a constant flow of pollutants coming off any site it does vary depending on the time of day and the time year and where their peak flows and dry season wet season. So it's not simply a matter that a farmer can take a sample today and take a sample next year and know that there's a change through for time and it is much more complicated than simply taking a bucket of water and saying ‘Oh, I've got a five kilos less fertiliser on’. It's a very complicated science. I understand that. Again while the information while those experts are there saying that there is surplus nitrogen, there’s a challenge to canegrowers to make sure it isn't their nitrogen, to manage the process that they can manage, which is the fertiliser requirements on their farm to best match the crop demand on their farm, to make it as likely as not that it isn't their farm that's contributing excess nitrogen. Vanessa: Alex I'd love for you to talk to me about the way that farmers access information. Alex: So there's plenty of information available to farmers on the Internet in published form. Certainly the BSES SRA have produced information on nutrition for many years and absolutely there are providers other than SRA scientists who have worked through resellers. There's a lot of information out there in the water quality space. There's a lot of information on the Internet, on the television. Growers can access information if they choose to. I guess what I've learnt through my job is that people come around to thinking about things at different times and it might not necessarily be on that Tuesday morning with when there's a professor in town talking about a new aspect of fertiliser or water quality that mightn’t be when they make their decision. They might be sitting thinking about it on the tractor and then either myself or maybe the neighbour, that will be chatting to that person and thinking ‘I wonder about this’ and then they might go on and talk on the Internet or they might talk to an extension officer like myself. And this is where I think I can help people. They might be interested in a particular topic. So then I'll go and find out information for them to read and to think about and to I guess beta test would be a jargon word but basically talk to talk to the people within their inner circle about whether they think that would work on their farm or not. There’s a key point that I do think needs to be said and that is that farming involves many different processes and fertiliser and nutrition is just one minor aspect of farming. It's important. And certainly from a water quality point of view it's very important that we get it as right as we can. But when you’re a sugarcane grower you've also got to think about weeds and insects. You've got to think about tractors, and labour, harvesting times, varieties, weather you've gotta think about machinery, you've got to think about contractors and sugar price. There are so many other things that are growers thinking about. Nutrition it's just one of many factors and sometimes when we are deluged by this sea of information about nutrition you get the feeling that some people think it's all about fertiliser and nothing else. Fertiliser is important and the grower will be able to access information, it's there and it's available. The grower needs to be respected as their own individual entity when they come to that decision and they need that information. Extension Services they try to help them find that information but the grower needs to work that into their own farming system because that's when you will make a practice change that matters that is adopted for the longer term when it's right for that farmers farming system just simply dictating that this is what you will do. That's not sustainable. Vanessa: That doesn't work with anyone. Is there anything else you want to add on that point about information and prioritising nutrition? Alex: I guess the other thing that I'd love to say is that every farmer who I work with is an innovative person. You cannot be a successful farmer and not be innovative. Now that might be innovative in terms of you know how you modify your tractor. It might be innovative in terms of how you work your farm. Growers are always thinking about what's the best way to be farming. And so farmers are by definition innovative. There is a jargon term called innovative farming practices and I support any growers who want to follow on those farming practices. But I think it's important to say that if they're not doing those innovative farm practices that doesn't mean to say they're not innovative. Almost by definition certainly farmers I work with in Tully are all very innovative people.